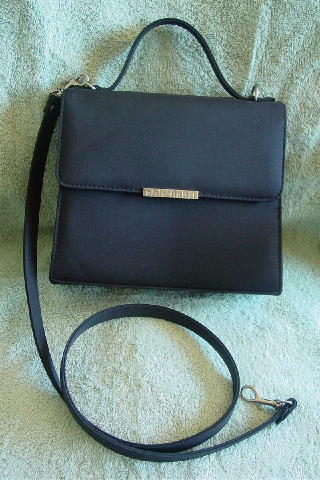 This black polyester purse is by Mondani. 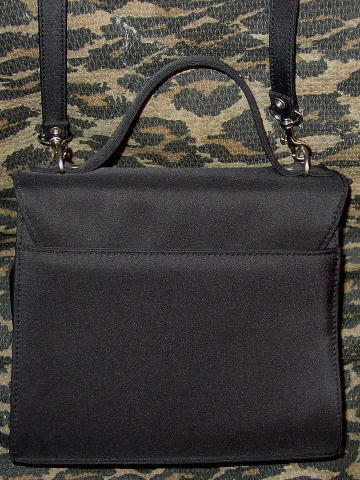 It has an 8" high by 3/4" wide handle and a detachable 39" long by 9/16" wide shoulder strap. There is a hidden magnetic closure under the flap and the interior has a black polyester lining and zippered deep pocket. The front and back have a 5 1/2" high open compartment. The front one is hidden under the flap. There is a silver-tone bar on the front flap with Mondani etched on it. It's from a stylist's inventory, and was used once, in a movie.